Already has it been related how the great leviathan is afar off described from the mast-head; how he is chased over the watery moors, and slaughtered in the valleys of the deep; how he is then towed alongside and beheaded; and how (on the principle which entitled the headsman of old to the garments in which the beheaded was killed) his great padded surtout becomes the property of his executioner; how, in due time, he is condemned to the pots, and, like Shadrach, Meshach, and Abednego, his spermaceti, oil, and bone pass unscathed through the fire;- but now it remains to conclude the last chapter of this part of the description by rehearsing- singing, if I may- the romantic proceeding of decanting off his oil into the casks and striking them down into the hold, where once again leviathan returns to his native profundities, sliding along beneath the surface :is before; but, alas! never more to rise and blow. While still warm, the oil, like hot punch, is received into the six-barrel casks; and while, perhaps, the ship is pitching and rolling this way and that in the midnight sea, the enormous casks are slewed round and headed over, end for end, and sometimes perilously scoot across the slippery deck, like so many land slides, till at last man-handled and stayed in their course; and all round the hoops, rap, rap, go as many hammers as can play upon them, for now, ex officio, every sailor is a cooper. At length, when the last pint is casked, and all is cool, then the great hatchways are unsealed, the bowels of the ship are thrown open, and down go the casks to their final rest in the sea. This done, the hatches are replaced, and hermetically closed, like a closet walled up. In the sperm fishery, this is perhaps one of the most remarkable incidents in all the business of whaling. One day the planks stream with freshets of blood and oil; on the sacred quarter-deck enormous masses of the whale's head are profanely piled; great rusty casks lie about, as in a brewery yard; the smoke from the try-works has besooted all the bulwarks; the mariners go about suffused with unctuousness; the entire ship seems great leviathan himself; while on all hands the din is deafening. But a day or two after, you look about you, and prick your ears in this self-same ship! and were it not for the tell-tale boats and try-works, you would all but swear you trod some silent merchant vessel, with a most scrupulously neat commander. The unmanufactured sperm oil possesses a singularly cleansing virtue. This is the reason why the decks never look so white as just after what they call an affair of oil. Besides, from the ashes of the burned scraps of the whale, a potent lye is readily made; and whenever any adhesiveness from the back of the whale remains clinging to the side, that lye quickly exterminates it. Hands go diligently along the bulwarks, and with buckets of water and rags restore them to their full tidiness. The soot is brushed from the lower rigging. All the numerous implements which have been in use are likewise faithfully cleansed and put away. 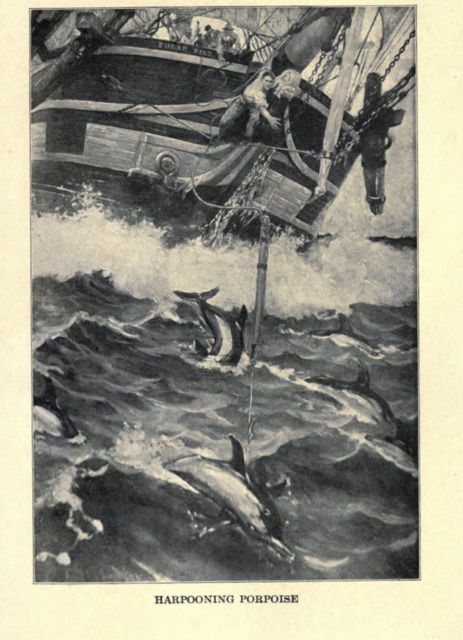 The great hatch is scrubbed and placed upon the try-works, completely hiding the pots; every cask is out of sight; all tackles are coiled in unseen nooks; and when by the combined and, simultaneous industry of almost the entire ship's company, the whole of this conscientious duty is at last concluded, then the crew themselves proceed to their own ablutions; shift themselves from top to toe; and finally issue to the immaculate deck, fresh and all aglow as bridegrooms new-leaped from out the daintiest Holland. Now, with elated step, they pace the planks in twos and threes, and humorously discourse of parlors, sofas, carpets, and fine cambrics; propose to mat the deck; think of having hanging to the top; object not to taking tea by moonlight on the piazza of the forecastle. To hint to such musked mariners of oil, and bone, and blubber, were little short of audacity. They know not the thing you distantly allude to. Away, and bring us napkins! But mark: aloft there, at the three mast heads, stand three men intent on spying out more whales, which, if caught, infallibly will again soil the old oaken furniture, and drop at least one small grease-spot somewhere. Yes; and many is the time, when, after the severest uninterrupted labors, which know no night; continuing straight through for ninety-six hours; when from the boat, where they have swelled their wrists with all day rowing on the Line,- they only step to the deck to carry vast chains, and heave the heavy windlass, and cut and slash, yea, and in their very sweatings to be smoked and burned anew by the combined fires of the equatorial sun and the equatorial try-works; when, on the heel of all this, they have finally bestirred themselves to cleanse the ship, and make a spotless dairy room of it; many is the time the poor fellows, just buttoning the necks of their clean frocks, are startled by the cry of "There she blows!" and away they fly to fight another whale, and go through the whole weary thing again. Oh! my friends, but this is man-killing! Yet this is life. For hardly have we mortals by long toilings extracted from this world's vast bulk its small but valuable sperm; and then, with weary patience, cleansed ourselves from its defilements, and learned to live here in clean tabernacles of the soul; hardly is this done, when- There she blows!- the ghost is spouted up, and away we sail to fight some other world, and go through young life's old routine again. Oh! the metempsychosis! Oh! Pythagoras, that in bright Greece, two thousand years ago, did die, so good, so wise, so mild; I sailed with thee along the Peruvian coast last voyage- and, foolish as I am, taught thee, a green simple boy, how to splice a rope.